Have the consent of your landlord, or alternatively, your family. Be able and willing to spend the time and money necessary to provide training, medical treatment and proper care for your Shiloh. Notify all references who you list on this application, including veterinary clinics and private individuals giving them your permission to speak frankly with an ISSDC representative when contacted. Expect to be contacted by an ISSDC representative with additional questions that will help us in processing your application. Assist in scheduling a home visit if feasible. How did you hear about the ISSDC? Do you have a pet sitter/kennel/etc available for taking care of your dog in an emergency? What activity level are you looking for in your dog (select one)? 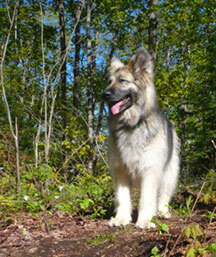 Would you consider a Shiloh looking dog often referred to as a “Shiloh Wanna Be” in our website (i.e. a possible long-haired German Shepherd or a Shepherd mix)? By submitting this electronic application, I certify that I have read the above information carefully and have filled out this application honestly. I understand that if an omission or untruth is discovered after an adoption takes place, ISSDC reserves the right to annul the adoption and reclaim the dog. Should such a situation lead to legal process, I agree I am solely responsible for all costs, including attorney fees and court costs. I have read the ISSDC Adoption Agreement and am willing to agree to and comply with its provisions. I understand that all the above information will be verified and by signing this, I give my permission for this verification. I understand that at no time will I be permitted to rehome the dog with anyone else without written permission from an authorized representative of ISSDC. I agree to a home and yard visit if it is required and to a personal interview with a member of this rescue effort or their agent to determine the suitability of my home to care for a Shiloh Shepherd. If at any time, in the opinion of ISSDC or an agent, that it is to the benefit of the dog’s well being to be removed from my care, I will relinquish said dog immediately and without negative incident. If this is to lead to a legal process, I agree I am solely responsible for all costs, including attorney fees and court costs. Depending on the dog which I am adopting, I understand that the adoption contribution is generally $250.00 and will go directly toward helping to offset medical costs and services associated with ISSDC. I fully understand and agree to assume all risks involved in the adoption of a dog from ISSDC. I agree to hold ISSDC harmless and not responsible for any injury(s) that I might sustain resulting from the adoption. This waiver includes the above understanding for myself, all of my family members and the descendants of such forever from seeking any legal action whatsoever against ISSDC and/or its representatives. I understand that dogs who are still in the care of an owner or in a shelter at the time of adoption are NOT evaluated by the ISSDC Rehome/Rescue inititive and that the ISSDC makes no guarantees regarding their description, temperament or behaviour.